Coleman Red Canyon Tent Review – How Good is it? Who is the Coleman Red Canyon Tent for? This Coleman 8 Person Red Canyon Tent is great for many types of people. It is very popular amongst families and groups of friends. This tent could handle 2 smaller families at once or a family with some pets with absolutely no problem. Or equally it could handle a well sized group of friends that have plenty of room and space to move around it and most importantly not feel cramped. I must state that even though this tent is an 8 person tent. If 8 people where to occupy it, it would be shoulder to shoulder and wouldn’t be an enjoyable experience. I feel it would more suitable to a family of up to 6 people, that way they are going to really enjoy and appreciate the size and airiness of this tent. Firstly let’s talk about the set up. It’s simpler to set up than you might have thought. It only takes about 30 minutes and a lot of that time is actually just attaching the tent guylines. Though once they are attached you will not have to do it over again. I could imagine if you are building the tent alone and aren’t that tall it could cause a nuisance for you especially the poles in the central area. Of course this shouldn’t be any inconvenience if you have someone to help you or are a little taller. The poles are meant to be color coded for making the set up go a little smoother. Though some people have stated this isn’t always the case. It must also be noted that there is no instruction of how to pack it back up. This may not seem like a massive deal but just make a mental note or take a picture of how it’s packed. This will greatly help you when you are going to pack it up after use. One final small tip when packing back up is to make sure you use the tents poles to roll the tent in the direction of the door. Now let’s talk about the interior of this 8 person tent. The inside of this tent is really spacious and provides a lot of room to move around in. I really enjoy the style of the inside with some mild gold coloring. I know this isn’t a big deal for most people but I appreciate these subtle touches that Coleman has included. Another one of the features of this tent that you can divide up the interior space. This is an excellent feature for families to separate the space up if they want to. How it basically works is there are provided room dividers which can be attached using a loop system. Now the rain fly that is provided does a brilliant job. The design of the rain fly is somewhat questionable. It’s placed away from the tent the whole way round and it even touches the tent in some spots which doesn’t seem logical. A rain fly shouldn’t touch the actual main part of the tent in ideal circumstances. I know this seems an apparent problem but for me and most people the rain fly does an excellent job of keeping the water out. I have experienced at least 5 heavy rain storms in it and I haven’t ever noticed one drop of water on the inside. It’s worth mentioning that the zippers on the tent are not are the utmost of quality. They seem a little fragile and some select people have had problems with there’s. Though it seems to me that most people don’t have any issues. I would just personally advice to be careful with them and take your time when opening and closing and I highly doubt you will have any problems if you do. The tent also features a gear net which is attached to the ceiling. This is perfect for storing things like keys, mobile phones and wallets. The tent has interior pockets as well which again can be used for additional storage. It’s worth mentioning that the tent comes in with 3 color combinations dark red with a black top, black with a blue top and finally black with a grey top. It is good you have some choice if you are the type of person who likes something that is appealing to your eye. They are all around the same price as well. My personal favorite is the blue one as can be seen below. Color coded pole system (sometimes can all be black like mine where). Tent stakes made from steel and a hammer to hammer them in ( I did read about some people not getting the hammer in there package but I am sure you can buy a rubber hammer for approximately $2 from a local store). Split off storage bags used to keep the set up equipment. Built in storage loft and pockets. Removable walls that are used for splitting up the tent for additional compartments and privacy if needed. You might of thought moving this around in the bag that is provided may be a hassle but no. It only weighs in at about 25 pounds or 11 kilograms. So it is really portable and easy to move around when transporting it from one place to another. Spacious: As I mentioned earlier this tent is extremely spacious, it can hold up to 8 campers at once. The room dividers allow for the tent to be split up into 3 rooms which is a great feature. The tent measures in at 17 ft by 10 ft with a central height of 72 inches. 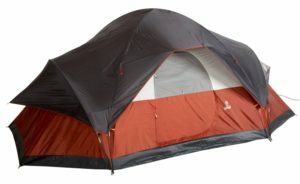 Airflow: The airflow on this tent is very good. It has a technology called cool-air port and variflo which provides for a great ventilation system. It allows you to adjust this yourself. 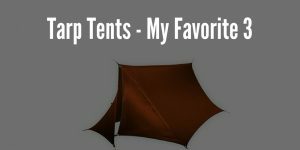 I have read lots of reviews from others of using this tent in temperatures of 95 degrees but because this tent has many vents along with a mesh roof, they were still able to remain cool even in that soaring temperature. Setup: The setup as I said before is very simple especially if you have a friend or family member to help you will the set up. Approximate 1 person set up time: 30 minutes, 2 person or more set up time: 15-20 minutes. Waterproofing: The tent is known for being top of class especially for the price range. It keeps you dry no matter what. I myself and many others who have the tent can vouch for this statement by Coleman. They call the system Weathertec and they guarantee to keep you dry. It really does live up to the promise. Some important features include the rainfly which protects against the rain. The design and shape of the tent with slightly sloping top and zipper mechanism which both assist in keeping you nice and dry all of the time. Build Quality: The construction of the tent is very solid and you can tell a lot of time and thought was put into this design and the materials that were used. All seems and fabric are very durable which is great because I am sure at some point you are going to accidentally step on it when setting it up or taking it down. Value: Of course the value of this tent is top notch. It provides features and quality that some $250 tents can’t even match. And the best part is sells for a faction of their cost. You will struggle to find anything better at this price range. Room Dividers: The room dividers don’t have any zippers for entrance so the only way to get in and out when they are in usage is to unhook and that also removes the separate room feature when doing so. Side windows: The side windows don’t have any closures. I know this is nit picking a little but I would still like to see that feature included. Packing: As I wrote about before it can be a little troublesome packing up. I do suggest taking a picture of how its packed so they you can place it in how it was originally packed. There is no instructions on how to repack everything which is a little annoying. Zips: The zips seem prone to break if you don’t treat them with some care. It seems to be true based on other peoples thoughts that if you are careful when using them and take your time opening and closing them you will have no problems in the long run. 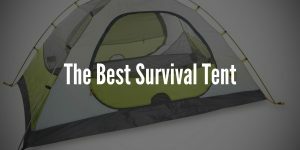 There is one quick and easy fix if you do have a leak and this technique will work with any tent at all. Even though it is rare on this tent I do want to offer an easy solution to fix the problem if it does occur. Simply you need to seal the seams. When you purchase from any manufacturer even when they use some fancy weathertech terms, they cannot really guarantee that it will not leak. Basically all of the material that the manufacturer in this case Coleman coats it with a water resistant product. The seams are not usually treated and on some rare occasions holes are formed after stitching and sewing has taken place. So there is a product I like to use called camco silicone aerosol spray. How you basically use it is after setting up the tent without the rainfly you apply the spray to all the seams both on the inside and outside and also on the rainfly. Remember to apply a good amount to each of the seams and leave it some time to dry. This will definitely do the trick and will seal any leaks that you may have had. The product is very cheap you can pick it up in your local Walmart for under $5. If you are intending on using this tent often and frequently I would recommend doing some zipper maintenance occasionally to keep the zipper in great condition over a period of many years of use. One technique to do this is to get a soap bar and after you have unzipped the zip after exposing all the zip’s teeth you want to rub the bar of soap along the zippers teeth. As soap is made with wax this will then act as a lubricant and will help keep your zipper as good as new for the camping trips ahead. I have gone through and gauged all of the user feedback of the Coleman Red Canyon Tent both positive and negative. 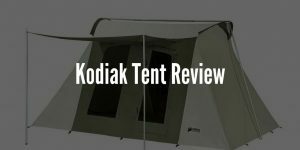 Overall this tent really ticks all the boxes and it does so at an incredibly low cost. The people who have had problems with this tent seem very rare which really shows the consistency there is over a massive amount of people. In conclusion, there is a reason this Coleman tent is a best seller on Amazon over the past years since it first released in 2008. Coleman has always been known to provide the finest of quality products and there is no exception here. Therefore if you are wanting to invest in this Coleman 8-Person Red Canyon Tent. I would exceedingly recommend it and you are certain to love your time with this tent. It offers you with a comfortable stay, with plenty of space and room inside. A solid adjustable ventilation system that keeps you cool even on the hottest of days. Most importantly it keeps you dry no matter what and all at a very low and affordable price. I am confident this is the perfect tent for you.